Man, Heinricy 1.5+ seconds a lap faster on a 1-minute lap? Next thing you'll tell us is that he was holding back and using last year's car the way it came off the track from the Runoffs. Course maybe we're missing some details but the rest of the field seemed fairly consistent, except for Heinricy. Tom Sloe broke a balljoint during the morning warmup, had about 17 minutes to fix it. 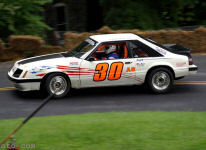 Brought out a Fox Body car well into the race. Heinricy didn't really have anybody to contend with. You could put a blanket over Hynes, McVicker, and Tom Less for the whole race. Never more than a couple of cars between them. Did Tom Less have the ex-McDermid car out? Yes I did. The car ran well and I enjoyed running in the tight pack......kept waiting for one little crack, but everyone drove excellent. Hey Tom, the car looks gorgeous! I am not a big fan of yellow cars, but your car sure looked sweet! One question: do those cars always get that loose? Man, when I was passing you through Turns 1-3 I saw as much of the passenger door as I did the rear bumper! Kudos to you for controlling that beast! The car got very loose. I couldn't figure it out until after the race. The right front ball joint which is pressed into the lower arm came completely out! It was just woobling around about 2" lower then it should have been with the right front wheel going where it wanted to go. I was lucky it stayed together. Thanks for the complement on the car. Its a great car when all is well with it. Sounds like an illegal modification of the lower ball joint, resulting in lowering of the roll center. Everyone will show up with this mod at the runoffs. Its a good mod. to enhance "drifting".